Former U.S. Congresswoman Gabrielle Giffords speaks at Augsburg. Former Congresswoman Gabrielle Giffords and her husband, retired Naval Captain and NASA Astronaut Mark Kelly, spoke at the Nobel Peace Prize Forum on Augsburg’s campus in September. 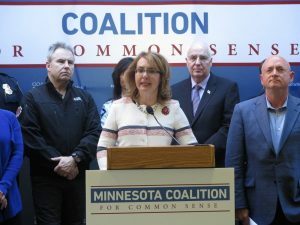 Following a failed attempt on Giffords’ life in 2011, Giffords and Kelly formed the “Americans for Responsible Solutions”, an organization centered around reducing gun violence. Citing loopholes in current U.S. gun laws, the organization supports legislation for common sense gun laws and reform. Listen to the replay of their Peace Prize Forum talk, rebroadcast by MPR News. This month, officials from Augsburg College and Anoka-Ramsey Community College launched the Auggie Plan, a guaranteed pathway to a four-year degree for community college students who meet minimum GPA requirements and who complete general education coursework on their way to enrolling at Augsburg College. Students in the program can take a range of liberal arts courses with the knowledge the courses will be accepted by Augsburg. Listen to Minnesota Public Radio’s story, “How Minnesota colleges are teaming up to give students a cheaper path to 4-year degrees,” which included an interview with President Paul Pribbenow. Augsburg College Professor William “Bill” Green studies and writes about Minnesota history and law. He recently was quoted in a Minnesota Public Radio article that examined the roles non-black activists play in furthering the Black Lives Matter movement’s agenda. 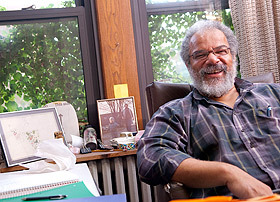 In the article, Green called on the history of the U.S. Civil Rights movement to analyze current demonstrations and protests. He also discussed the ways “protest fatigue” could impact the movement’s progression. Read, “Allies on the front lines: Black Lives Matter’s non-black activists” on the MPR News site. Minnesota Public Radio included an interview with Augsburg College student Mohamud Mohamed ’19 in a recent article about a federal anti-terror program aimed at Somali youth and designed to counter terrorist efforts to radicalize young American Muslims. Other community members interviewed in the article oppose the program for its links with the Department of Justice and concerns over potential surveillance abuses the program may allow. Mohamud Nur, of the the Confederation of Somali Community in Minnesota, disagrees. “It is to help the community find better opportunities. I’m confident that the people who are going to be seeking help will get the help that they are seeking,” he said. Mohamed also has concerns about the alienating effect such a program can have on him and his peers. “I’m being pushed into the margin, as inherently violent, inherently extreme, someone that needs to be saved from their own devices. And that’s deeply troubling. And I can’t ever sign onto that,” he said. Read Some young Somalis voice skepticism about federal anti-terror program on the MPR site. Minnesota Public Radio News recently published an article and audio interview with Natalie Shaw ’16, a student at Augsburg College who has been volunteering for Hilary Clinton’s presidential campaign. Shaw recently went door-to-door in Des Moines, Iowa, encouraging voters to turn out in support of Clinton at the state’s Democratic caucus slated for February 1. Shaw credits her father’s volunteer work during John Kerry’s 2004 campaign as the impetus for her love of politics and political organizing. Read and listen: Iowa in January? You bet, says 21-year-old political volunteer on the MPR News site. Several media outlets have recently published curated lists of local events scheduled in celebration of Martin Luther King Jr. Day, which takes place on Monday, January 18. The lists published by the Saint Paul Pioneer Press, the Minneapolis Star Tribune, and Minnesota Public Radio News each included Augsburg College’s MLK Convocation, an annual event that honors the legacy of King with notable speakers addressing topics of race and social justice.